On Tuesday, March 1st, EPPC Senior Fellow James C. Capretta testified as a part of a panel at a hearing held by the House Judiciary Committee’s Task Force on Executive Overreach. A video of the entire hearing is available here. Mr. Capretta’s written statement is available here and below. The testimony of the other witnesses is available here. Mr. Chairman and members of the Task Force, thank you for inviting to me participate in this hearing. And, of course, the power to write laws resides with the Congress. So, unlike a king, a United States president cannot decide to withdraw funds from the treasury without an appropriation by Congress, no matter how pressing the purpose. Even in an emergency, such as in the aftermath of 9/11, presidents must go to Congress and ask for funding. This “power of the purse” is arguably the most important power granted to Congress in the Constitution. It is the primary means by which the people’s elected representatives exert control over the size, direction, and activities of the federal government. Over recent decades, Congress has chosen to steadily dilute its power over spending authority by granting to the executive branch permanent, and oftentimes unlimited or ambiguous, appropriations. This granting of permanent spending authority, generally for programs that are called “entitlements,” has delegated to the executive branch significant discretion over the terms of this spending. In effect, important aspects of the legislative function have been delegated to the executive. Moreover, because much of this spending authority is open-ended (or “indefinite” in appropriations terms), Congress has also given up substantial control over the overall size of government, over total federal spending, and over deficits and debt. Any examination of how Congress has lost some of its power to the executive branch must take into account this long-standing trend toward delegation through permanent appropriations, and what might be done to begin reversing it. The list of programs with permanent spending authority in current law is long. It begins, of course, with the major entitlement program: Social Security, Medicare, and Medicaid. But there are many other programs with permanent spending authority, including: the Supplemental Nutrition Assistance Program (SNAP), the Social Services Block Grant, some functions of border security and control, portions of federal housing assistance, reinsurance and risk corridor payments to insurance companies under the Affordable Care Act, and much else. Much of the spending associated with these program is defined by detailed provisions written into law by Congress. For instance, Congress has written into law the formula for calculating benefits payable under the Social Security program, leaving little discretion in this regard to the executive branch. But, even with such formulas in law, the executive branch has substantial discretionary on other areas of program administration, some of which are just as consequential in terms of federal spending. For instance, the Social Security program provides benefits to retirees but also to workers who become disabled and can no longer work. Congress has provided open-ended spending authority to the executive branch to pay benefits to anyone determined to be disabled according to the lengthy and complex rules written by the Social Security Administration. Changes in those regulations, which have occurred intermittently throughout the program’s history, have resulted in swings of billions of dollars in federal spending without any action being taken by Congress. The spending authority provided by Congress for other programs are also flexible enough to accommodate substantial, and expensive, executive discretion. For instance, the Obama administration used its authority under the SNAP program to waive the state-enforced work requirements in the program. The result has been a surge in SNAP spending that is well above the historical norm, even after taking into account the soft labor market of recent years. The provision of permanent, and open-ended, spending authority by Congress has resulted in a complete transformation of the federal budget. 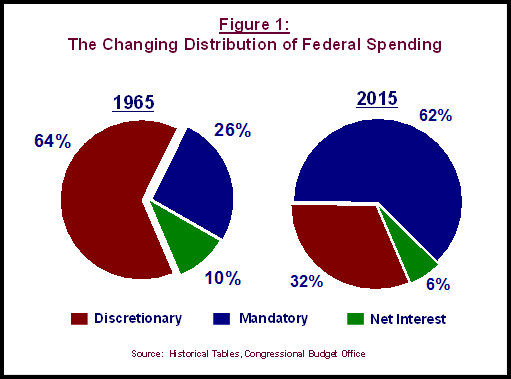 As shown in Figure 1, in 1965, 64 percent of the federal budget was devoted to annually appropriated accounts, often called discretionary spending. This portion of the budget is heavily focused on the military and associated defense spending, but also includes funding for many bread-and-butter operations of the government, such as health research, federal support for primary and secondary education, operation of the national parks, and funding for the federal bureaucracy. Spending on mandatory programs, or entitlements, accounted for 26 percent of the federal budget in 1965. Net interest payments on the national debt accounted for the final 10 percent of federal spending. By 2015, the relative positions, in terms of portions of the overall budget, of discretionary and entitlement spending had flipped. Discretionary spending is now about one-third of all federal spending (32 percent) while spending on entitlements takes up more than three-fifths of the entire budget (62 percent). Of course, it is not a coincidence that, as budgetary pressures have risen with the growth of entitlement spending, political pressure has built to cut discretionary appropriations. That trend is likely to intensify in the coming years as the retirement of the baby-boom generation and rapid escalation in health costs push up spending on Social Security, Medicare, and Medicaid. Congress has very little budgetary control over these programs, so the easiest way to trim spending in the budget is to cut defense and other appropriated accounts. This is an important reason budget deals over the past twenty-five years have placed much more restraint on discretionary accounts. But, as we saw last year, there is only so much that can be squeezed out of the military and even many other discretionary programs. 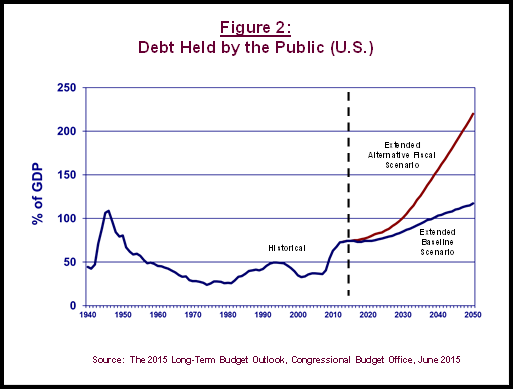 Consequently, the continued rapid rise in mandatory spending will result in large and growing budget deficits in coming years, and will push federal debt above 100 percent of GDP by 2039, according to CBO. CBO has also projected what would happen to federal debt if certain optimistic assumptions, like a continued reduction in discretionary spending, do not occur. Under that scenario, federal debt would exceed 100 percent of GDP as early as 2030. It will not be possible to reverse the trend toward permanent appropriations authority quickly. Nor would it be advisable for Congress to undo such authority in every program. For instance, in Social Security, it is important to have a program with some certainty associated with the provision of retirement benefits; workers need that to make appropriate financial plans. But making allowances for the legitimate need for program certainty need not mean that Congress must cede all budgetary control to the executive branch. Additional Spending Control: Through the budget resolution, Congress can impose limits on what is spent on discretionary appropriations each year. The budget process could be amended to place an overall limit on total mandatory spending as well. This would go a long way toward restoring Congress’ role in establishing a real budget for the federal government. Such a limit would need to be enforced with automatic cuts in spending if it were breached. If projections indicated that, absent a change in law, spending would exceed the overall limit imposed by Congress, then the budget reconciliation process could be used to set in motion reforms to the programs that would allow overall mandatory spending to fall below the upper limit. Programmatic Limits: Congress could also begin to reassert its role by imposing specific spending limits for certain programs. For instance, Congress could specify that a program’s permanent appropriation may not grow by more than the rate of inflation each year (or perhaps not at all, if that were the appropriate benchmark). In the event a program were projected to grow faster than was allowed in permanent law, the executive branch would be forced to come to Congress and ask for additional spending authority. Conversion of Programs Back to Annually Appropriated Accounts: Congress should also take away permanent appropriations from as many programs and functions as possible. For instance, in the Affordable Care Act, Congress provided a large, recurring appropriation of $10 billion for the Center for Medicare and Medicaid Innovation. This agency and its mission should not receive automatic funding. Rather, it should be forced to compete with other agencies and programs for funds in the annual appropriations process. The U.S. Constitution gives Congress the sole power to appropriate funds out of the treasury. Over many years, and for many understandable reasons, Congress has written into law permanent appropriations that have the effect of handing more power and control over the federal government to the executive branch. Rapid growth in spending on programs with permanent spending authority is the reason the federal government is running large deficits today and is projected to run even larger deficits in the future. Moreover, ceding control over spending programs to the executive branch runs counter to the original balance that the founders intended for the federal government. It is time for Congress to begin reversing the trend of the past several decades with more limits on permanent, open-ended appropriations.